Jeff Baker landed yet another big league job this spring. Veteran infielder Jeff Baker is at the stage of his career when any job is a good job. Last year, he was passed around like a number at a Grateful Dead show, getting dealt from the Cubs to the Tigers in early August for two PTBNLs, playing all of 15 games for Detroit and then getting shipped off to Atlanta for a PTBNL. In the span of 26 days, Baker wound up creating three players to be named later. 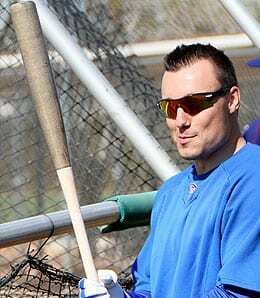 This spring, he had to work his way back onto a big league roster and he did so in style, batting .424 with 12 runs, a homer and nine RBI to earn a utility job with the Texas Rangers. He’s a second baseman by nature, but can also man either corner outfield or infield slot. The bottom line is that the 31-year-old has pretty much been in free fall offensively since 2008 — the year he received his most PT ever (104 games, 299 at-bats). Leaving Coors was Baker’s death knell, yet he continues to hang on as a fringe major leaguer, refusing to go quietly into the night (or, in this case, head to Indy ball or Japan). Anthony Rizzo wasted no time in making a big impact, taking the first pitch he saw on Opening Day and smouldering it for a two-run dinger. Not bad for a dude that went homerless in Spring Training and at the WBC while toiling for Team Italy. It wasn’t just a wallscraper, either. Rizzo’s blast completely left the ballpark. This dude is going to crank plenty of long balls this season. Alex Rodriguez (hip) is making progress, but still won’t return to the Yankees until after the All-Star break. Jayson Nix started at third base on Opening Day for the Bronx Bombers and he didn’t exactly make us forget A-Rod, going 0-for-2 with two strikeouts. In the sixth, Nix was removed for a pinch-hitter (Lyle Overbay, who flied out) and replaced in the field by Kevin Youkilis, who shifted over from first base (and was replaced by Overbay). Not your Father’s Yankees, are they? Crave more in-depth Fantasy analysis? Then join us every Thursday at 9 p.m. EST for RotoRob’s Fantasy Baseball Weekly Podcast on Blogtalkradio. Tim McLeod and I will entertain and edify you for a half hour or more each week. We’re off this week for to attend the Philadelphia Flyers game, but will return on April 11. Tune in here. This entry was posted on Tuesday, April 2nd, 2013 at 2:05 pm	and is filed under BASEBALL, Fantasy Notes, RotoRob. You can follow any responses to this entry through the RSS 2.0 feed. You can skip to the end and leave a response. Pinging is currently not allowed.